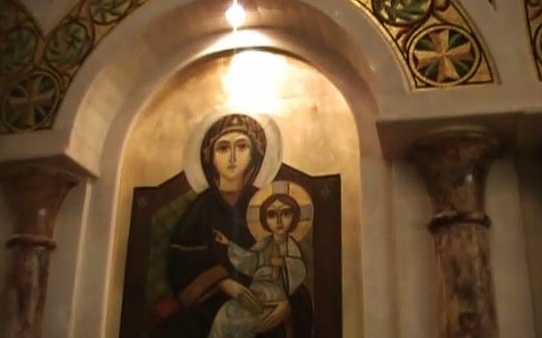 See/view [video] about St. Mark's weeping Icons. [View] Papal Declaration about the weeping Icons. On May 15, 1990, His Grace Bishop Tadros was visiting our church. He prayed the Vespers service and then gave a sermon. The sermon was the life of St. Athanasius the Apostolic, whose feast was that day. Then he told us about the miracle of healing which had happened recently in his diocese of Port Said, Egypt. After the sermon, His Grace led the congregation in praises and doxologies for the Virgin Mary and our other saints, specifically St. Athanasius the Apostolic. During the singing of the praises, a deacon noticed some oil on the icon of the Virgin Mary and went over to tell Fr. Mikhail E. Mikhail, who then told Bishop Tadros. 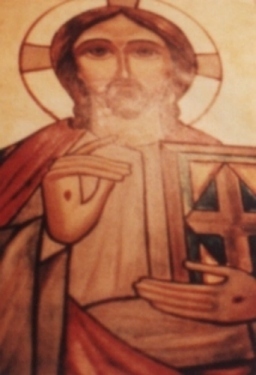 After the praises were finished, His Grace went over to examine the icon and then announced it to the congregation, who immediately went up to see it. The oil appeared in straight lines from the neck of St. Mary. His Grace began anointing everybody with the oil from the icon. Oil began to seep again from the icon of the Virgin Mary on Sunday May 20, 1990 after the Divine Liturgy. Oil also started to seep for the first time from the icon of the Lord Jesus Christ that same day. The oil poured from the forehead and eye, then it began to pour downwards to the right hand of the Lord Jesus Christ. Oil seeped on several other days throughout the month of May and June, 1990. Many people, including Fr. Mikhail, have noticed the presence of incense in large amounts on some days, even though no ritual services, including the Raising of Incense had been performed those days. Oil also seeped again in August of 1990, during the Egyptian Festival. A good amount of oil had seeped from both the icons of the Virgin Mary and the Lord Jesus Christ. Many people attending the festival witnessed it including a reporter who wrote an article in the Cleveland newspaper, The Plain Dealer. After the newspaper article was published, thousands of people from all over came to the church to see the oil and be blessed by it. The Plain Dealer published several other articles about he matter. as well as a number of religious magazines and other newspapers including the community paper, The Parma Sunpost. Local television channels as well as the national channels, NBC and CNN, gave the matter great attention. Radio stations also broadcast many programs about it. Oil again began to see throughout September and October of 1990. It was witnessed by a number of bishops including His Grace Bishop Thomas of Koussia, Egypt. As many as 60,000 people, from various denominations and religions, came to the church over a 15 months period from all over the United States to see the seeping oil from the icons. A number of miracle healings were experienced by Copts and Non-Copts alike. One of the healings happened to Francis Picarek who regained his sight after all hope was lost. After receiving several reports from the bishops who had seen the icons as well as Fr. 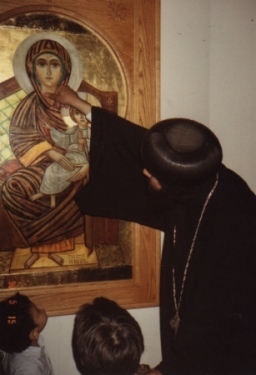 Mikhail himself, H. H. Pope Shenouda III came himself to see the icons on January 19, 1991. Then after reviewing all the reports of the bishops and of those who had experienced miraculous healing, H. H. Pope Shenouda III issued an official papal declaration regarding the matter. He declared that the phenomenon of the seeping oil from the icons was an official miracle. The papal declaration was dated May 15, 1991, the first anniversary of when the miracle first happened.